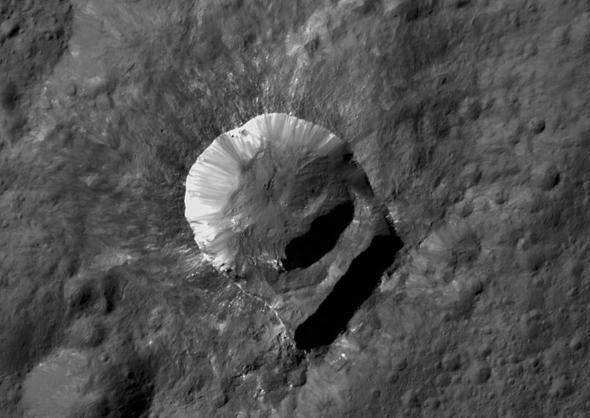 Dawn image of Oxo crater on Ceres shows it may have triggered a massive landslide. Oxo crater on Ceres has an enormous landslide right next to it. I know I just wrote about how weird Ceres is (as well as how ridiculously beautiful it is), but honestly, it’s really really weird, and there’s more stuff to show you. Like Oxo, a 10-kilometer-wide impact crater seen above. Obviously, something peculiar happened there! It looks at first glance to be a more or less normal crater on Ceres, but it’s got that huge slump formation off to one side. What the heck? There are clues to what happened. If you trace the intact part of the rim around to make a complete circle, you’ll see the collapse must have started outside the crater, with a huge amount of material then sliding into the crater, possibly partially collapsing the crater wall. That shelf feature sticks into the crater like a ledge. So obviously the object that hit Ceres to make Oxo impacted first, then the land nearby collapsed. Why? The sharp edge to the slump lies at the top of what looks like a ridge. Straight features on Ceres are associated with cracks or stress in the crust. A ridge can be formed when the crust is stressed, and part of it pops up. If so, that material could have less structural strength after being deformed, so when the crater formed that part of the ridge then slid into the crater. I don’t know if the impact itself did that, or if it happened millions of years later. But I strongly suspect the two events are physically linked. Note too that the crater has bright material on the left side, most of it looking like it was under the surface, then slid down the wall as it was exposed. Is that more salt, left behind by briny ice, as is supposed to be behind the bright spots seen all over the little world? Note the brighter splotches all around Oxo as well; combined they make it one of the brightest craters seen on Ceres from space. The floor of the crater is weird, too, like someone shoveled stuff into it. That may be debris from the giant landslide together with debris from what slid down the crater walls over time. 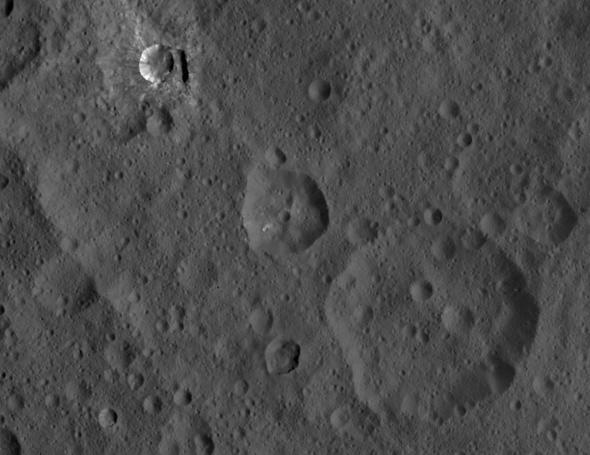 Oxo crater (upper left) in context, showing more craters on Ceres. As always when it comes to Ceres morphology (structure and shape), I’m guessing. My point here isn’t to give you a definitive answer to what you’re seeing, actually quite the opposite! We’ve only seen a few of the small worlds in our solar system up close, and Ceres is one of the more unusual ones. We’re still trying to figure all this out. Ceres is big enough (almost 1,000 km across) that its gravity is strong enough to shape itself into a sphere, but still has very low gravity on the surface, just 3 percent of Earth’s. Unlike moons it was never (as far as we know) near a bigger planet, so it is untouched by the effects of that (such as tides, for example, or interacting with a planet’s magnetic field). It’s not as cold as the outer planets, but cold enough to have water ice. It was trying to be a planet 4.5 billion years ago when it ran out of material to grow, so many planetary scientists think of it as a protoplanet rather than an asteroid (a term used more for the leftover rubble of planetary formation). Sometimes you have to study the weird objects to understand the bigger picture. Exceptions show you where slightly (or grossly) different circumstances can shape the structure and features of an object. So studying Ceres is a Good Idea. The Dawn spacecraft, which took the image of Oxo, is mapping Ceres from its current low altitude orbit of just 385 km. It sends back images as well as mineralogical data and elemental abundances. Planetary scientists are building up an understanding of this world, which will in turn build an understanding of many more worlds. Including our own Earth. And since we all live there, studying it and other worlds is a Good Idea, too. Postscript: If you’re wondering about the odd title, let me ask you: What’s Oxo spelled backwards?